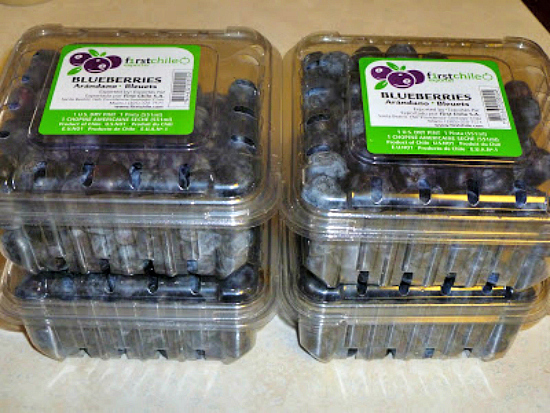 Last March, I posted about how to keep fresh produce fresher longer. None of us want to waste our money and have produce go bad before we get a chance to eat it. If you can, go back and check it out, and read the comments, they were full of tips on keeping produce fresh. One of the tips I mentioned from Muffin Tin Mom, was to soak apple slices in a lemon/lime soda before packing them up for lunch, to keep them from getting all brown and unappetizing. 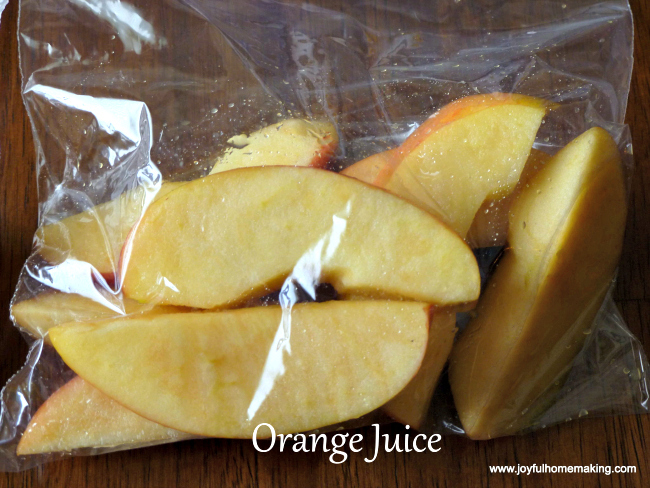 I decided to put it to the test along with a suggestion, from one of my readers, to try orange juice. 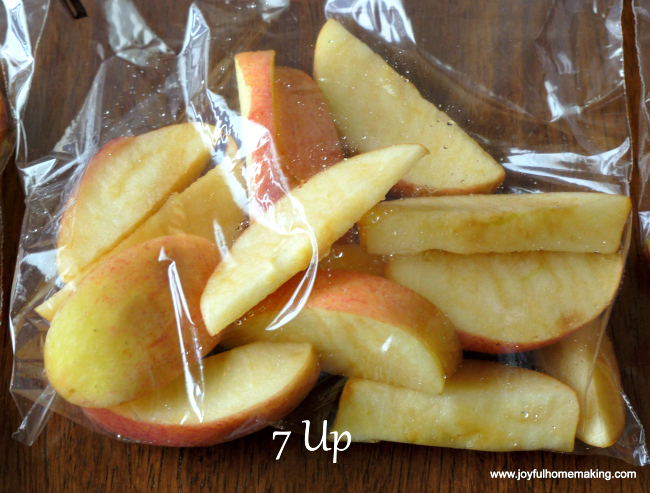 So I sliced up some apples, and soaked a few slices in 7 Up for a couple of minutes. 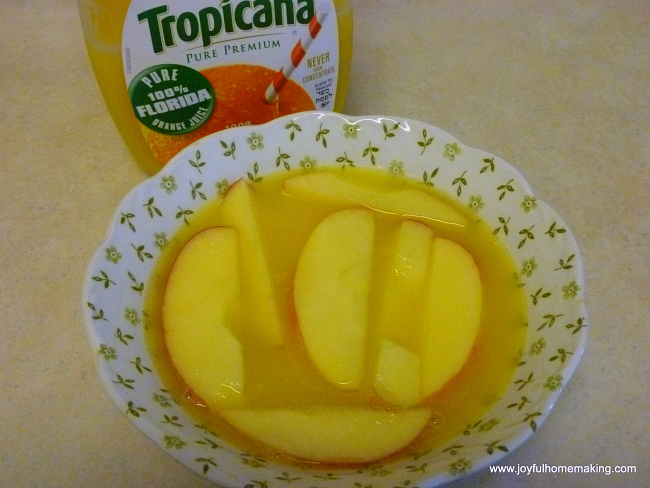 I also soaked some in orange juice. 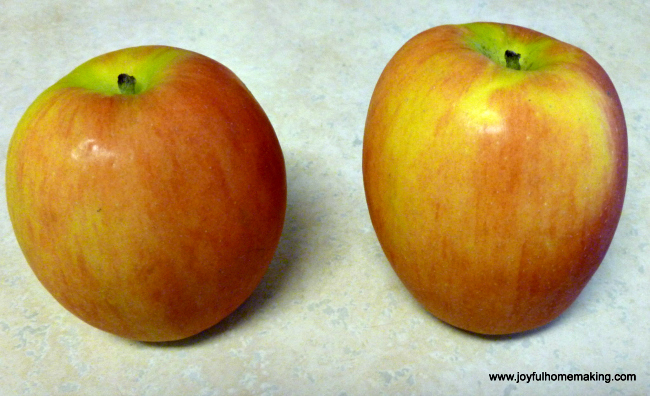 and bagged them up, along with some plain apple slices to see the contrast. The slices that weren’t soaked in anything were definitely browner. The slices soaked in soda were only slightly turned. 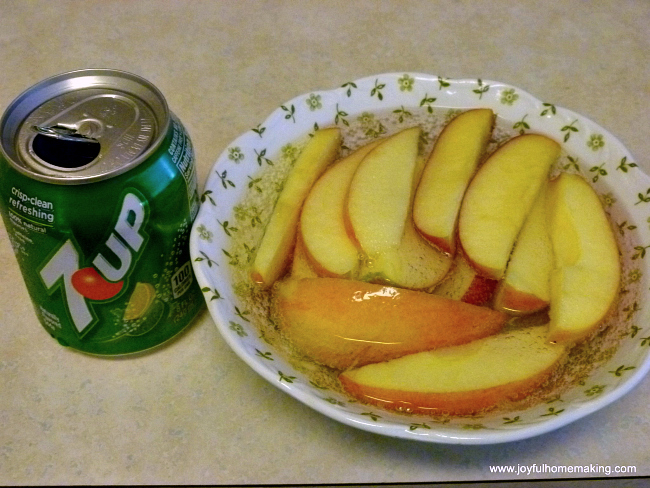 The ones soaked in orange juice were neck and neck with the 7 Up. My conclusion was that either the soda or the juice worked pretty much the same, so take your pick according to preference, and they were definitely more appealing than the ones not soaked at all! Thanks for your great tips! Hopping from Someday Crafts link up. I like to keep pear slices fresh with lime juice! I use lemon juice and they don’t turn brown at all. I am actually surprised there aren’t more people know this tip. I learned about back in the 1980’s when I was in college. The cafeteria I worked for served sliced apples all the time. We sliced them early in the morning & just dipped them in lemon juice, we never took the time to soak them. 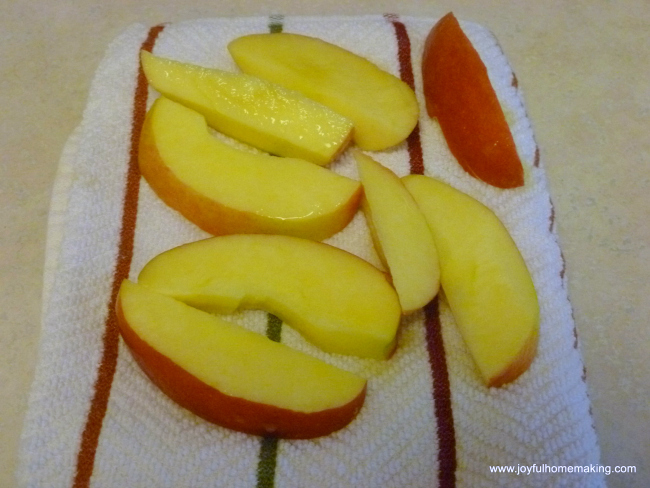 I often carry sliced apples to potlucks or brunches & they never turn brown. I like slicing them fresh that morning because sitting overnight they aren’t as firm. The leftovers though, stay just as clear for days in my fridge. I pour a small amount of lemon juice in a small bowl, dip one side, turn & dip the the other side – that way I don’t waste as much juice by pouring a large amount & totally emersing the slices. Good to know! Thanks for taking the time to test it and letting us know the results! Very helpful! 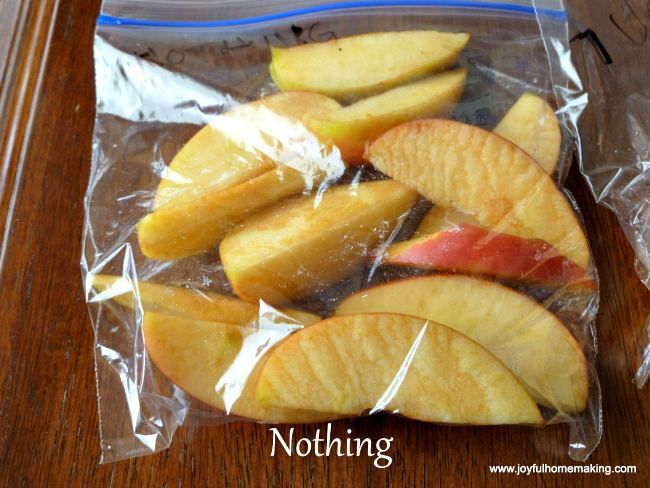 I’ve always wanted to know how to preserve the apples for a park trip so I don’t have to bring a knife. Thank you! Saw this post on Hope Studios Link Party. Check out mine, #35. I would love for you to share your favorite posts and link up at my TGIF Link Party. What’s wrong with simply using lemon juice? (Or lime or orange…) Squeezing some lemon into a bowl of water works just as good… It’s much cheaper!